The Ultimate Melamine and Veneer-Faced Plywood Cutting Blade! SAME DAY SHIPPING The Mel-Pro Series is a complete line of blades that solve problems associated with cutting melamine and other laminated wood products. Additionally, veneer-faced plywood can be cut without splintering at more reasonable feed speeds than in the past. FINER CUTS- Precision ground carbide teeth set on hand-tensioned tool steel bodies produce fi ner cuts without chipping and �bottomside blowout�. QUIETER- Patented resin bond-filled expansion slots effectively absorb vibration and reduce noise. LONGER LIFE- High-grade, extra-hard, micro-grain, anti-corrosive carbide teeth fi ght both chemical and abrasive wear to remain sharp longer. 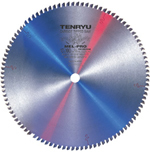 There are a lot of blades on the market that can cut melamine but only the TENRYU Mel-Pro can cut it chip free, quieter, easier and longer. Numerous requests for a better melamine blade prompted us to spend over a year of research and development to bring you the world�s most advanced melamine cutting blade. The Mel-Pro features a fully hardened, expertly tensioned tool steel body that absorbs impact, remains flat and true, and resists excess heat buildup. The Mel-Pro�s exclusive, red bond, resin filled expansion slots absorb vibration, reduce heat and permit the blade to run quieter than any other brand. The thin-kerf, mirror-like grind on super hard, specially designed carbide tips allow for lighter cuts and reduce friction heat buildup. The bottom line is your bottom line will look better when you reduce scrap, reduce sharpening costs and reduce noise in your shop with Mel-Pro blades.